In my last notebook post, on the black soft-bound Muji notebook, I talked about how I’m not a big fan of spiral notebooks. But Rollbahn notebooks, which are all spiral-bound, perform so well for me that I think I’ve come to embrace spiral notebooks. Rollbahn is not perfect, but because I like its design and paper quality so much, it’s now become one of my go-to notebooks. Rollbahn, which means “runway” in German, is a line of spiral notebooks made in Japan, by a Japanese stationery company called Delfonics. Delfonics started in 1987 with calendar diaries. Since then, Delfonics has expanded its line-up to include many types of office goods, and has even opened up its own set of stationery shops to carry their products as well as other brands. Rollbahn notebooks are readily available in Japan but that doesn’t seem to be the case here in the US, nor are they widely talked about, so I thought it might be nice to showcase them here. Not only do they look nice, they perform very well. I started using one in the “L” size (the main focus of this post) last year, and I’m on second one currently for writing my Three Staples ideas and posts. The Muji B6 notebook was also for working on Three Staples but while I like it for not being spiral-bound, I was excited to start using Rollbahn again when I finished the Muji one. I’m torn as to which notebook to use next, actually. I might just alternate between Rollbahn and Muji for Three Staples. The body paper of Rollbahn is one of the main reasons that made me excited to start using it again. It is simply a joy to write on. It is smooth, and its weight is not too thick or thin. I like using my fountain pens on it, mostly Japanese fine nibs, and the paper takes them like a champ. They just glide on the surface without much feathering, and I don’t see them soaking through the back. It is definitely smoother and better for fountain pens than the aforementioned Muji notebook. Another thing I like: the subtle 5 mm x 5 mm graph grid. It’s actually dotted, if you look closely. The lines are easy on the eyes, and the ruling is the right size for me. The body paper starts right off the bat when you open the front cover, and each sheet is the same, front and back, with the grid extending all the way to all edges. In that respect, each page is pretty basic and versatile. No fancy header or footer spaces or margins. But here’s a subtle detail I must mention: the two corners of the outer edge of each page are rounded. The yellow body paper of Rollbahn (center) compared to, from left: Field Notes Ambition, Field Notes Workshop Companion, and Field Notes Original. What’s really unique about Rollbahn is the color of the body paper. It’s yellow! It may be on the pale yellow side but compared to many other off-white notebooks, it’s decidedly yellow. I like non-white paper in general, so this is another positive point in my book. I like to use dark, muted colors, so they actually go well with the warm tone of the paper. I may not love spiral notebooks but I think Rollbahn is one of the first notebooks since I rediscovered stationery that has convinced me that sprials can be done well. I still worry about damaging the spiral but it’s actually double-spiral, so I find it quite sturdy. Supported by two thick, stiff covers, it’s retained its shape well so far. And I like that it is not much bigger than the overall thickness of the notebook. I haven’t had any problems turning pages though, and they flip all the way around to the back with ease. I don’t see the black coating flaking off either. As far as opening and leaving the notebook flat or collapsing it to one page, Rollbahn does it well, not just by the virtue of it being spiral-bound, but by good design choices. Size comparison: Muji B6 on top. Size comparison: “L” size (dark blue), “regular” size (light gray) and Field Notes Workshop Companion. These days, I prefer my work notebooks to be about the B6 size, and the Rollbahn in “L” size is pretty close to that (I hesitate to call this the large size because it’s certainly not large by American standards). I like this size because it’s just big enough to be comfortable but not too big to be intimidating. The L is overall wider than the Muji notebook but a page torn off the spiral is just slightly narrower than B6. Good thing I like this specific size because it seems to be the more common size carried outside of Japan, even though Rollbahn comes in a wide range of sizes and formats. Some are slim and long, some are even top-bound, and some are TINY with a keyring strap. Very cute. Here’s something I have to remind myself constantly: each page is perforated! This is a handy feature that is completely forgotten when I use it. I’m usually weary of perforated pages because they often tear off when I don’t want them to, especially if it’s a notebook I do a lot of page-turning and referencing. But with Rollbahns, that hasn’t been an issue for me. I don’t feel the perforation at all when I turn pages, and the paper seems strong enough. My use case for the notebook doesn’t have me tearing off pages often but when I need to, the perforation has helped and worked well. The Rollbahn covers are made of thick cover stock. I like them! The back cover is always the light brown, kraft color in matte finish, and the semi-matte front cover is white on the inside, with color of your choice on the very front. They are very stiff, so on top of protecting the body paper, they give you a good surface to write if you’re not at a desk or a table. Another detail that is not unique to Rollbahn but still appreciated is that the covers are slightly bigger than the body paper, so that they provide some protection for the innards. Coupled with the navy elastic band to hold everything together, Rollbahn is a very smart and portable notebook. As for the elastic band, it is attached to the back cover by 2 metal eyelets, and they seem secure and of good quality. Again, I’m usually weary of any elastic attachments because they inevitably get stretched out or fall off. But with Rollbahns, I haven’t had that problem; the one I’ve had since last year is still perfectly functional, maybe slightly looser but it’s still keeping the notebook together. The elastic closure is not a must-have feature for me but I can see its value when I want to carry it in my bags; the band will prevent you from jamming stuff in and accidentally opening the notebook or damaging the pages. It’s something I didn’t think I would appreciate. Look carefully: there are clear pockets there. As the official product name “Rollbahn Memo with Pockets” indicates, each notebook comes with 5 clear pockets, just before the back cover, in between two thick, yellow(er), blank pages. Even the micro-mini size comes with its own mini pockets. Ha! I find the pockets really neat, except I haven’t found much use for them yet. Maybe if I were in school, that’d be a different story. They are bound to the spiral, just like the main pages but they are clear pockets with an opening at the top. I wish these pockets were located after the front cover, not in far back. While I don’t use them very much, I can imagine them creating an uneven surface, if you are the type to accumulate stuff. Another thing that can prevent you from laying the notebook completely flat: the metal eyelets that secure the elastic band. While sturdy, they are thick, and depending on where you are on the page, you can feel them under your hand, especially if you’re working on a table. This is not a deal-breaker for me though. More reasons why I like Rollbahn: its appearance. I like that it’s simple and gender-neutral. It comes in a variety of basic and vivid colors. I like that it’s consistent (special editions excluded): the elastic band is always navy, the spiral black, and the back cover the light brown with debossed “Delfonics” on the bottom. And there are just enough details to keep it interesting, like Helvetica-set type on the front cover, the wing-like logo, and the rounded corners. Overall I find the design fuss-free, modern, and very approachable. Quality of the paper is top-notch but it doesn’t exude pretentiousness, in my opinion. It looks (and feels) like it’s meant to be used everyday anywhere you want to. My first Rollbahn is showing some nice wear, with scuffs and weathered edges exposing the white of the front cover. I like how this looks. One thing I can do away with are the German phrases on the front cover. With the help of online translation, I learned that they all have to do with travel and flying. That’s understandable, considering the meaning of “Rollbahn”, but I wish they weren’t there. I guess I’ve seen too many examples of products displaying badly or awkwardly written “foreign-language” phrases, that I’m a bit sensitive to the idea and think it should be avoided. Who knows, maybe these German phrases are not awkward at all (chime in if you’re fluent!) but I question whether they really add to the design or its character. But hey, if German words remind you of timless design and ease of use, as Delfonics say is the goal for their Rollbahn notebooks, then I think they made the right choice with the branding because they meet those expectations quite well. I think I’m good for now. The green plaid one is a holiday edition from 2014, and the red one commemorates the restoration of the Tokyo Station’s Marunouchi side. The far right one has textured cover with gold spiral. The L size comes with 140 pages for about 500 yen (roughly $4 USD at the very favorable exchange rate these days) but here in the US, you definitely pay an import penalty that more than doubles or triples that price. And that’s partly what’s stopping me from buying them whenever I see them here. And the fact that I stocked up when I went to Tokyo last time. I think I paid anywhere from 500 to 700 yen ($4-$6) for a Rollbahn in Tokyo, some of them being special editions. In the US, I spotted Rollbahn notebooks a long time ago at Madewell and was more than willing to pay the import price because I was so happy to see them. Madewell no longer carries them but their parent company J. Crew might still have them in the men’s section at your local store; I accidentally found them in the San Francisco store recently at a reasonable sale price. (On a side note, it baffles me that when retailers carry Rollbahn as accessories, they are often categorized as men’s. Seriously?). I also spotted the special versions with textured covers at Voyager in San Francisco some time ago; there you definitely pay the boutique shop price but it’s still worth a look. The biggest selection of Rollbahn notebooks I’ve come across outside of Japan is at Paper-Ya at Granville Island, Vancouver, BC. They had a variety of colors and sizes. Online, Rollbahn seems more readily available, Walker Art Center Shop and East Dane (the men’s branch of Shopbop) to name a few. Just be sure to check the dimensions listed on each product page. I go with the size names used on the Delfonics online shop but other retailers might label them differently. For example, East Dane calls the L size Small. Beautiful packaging (left) and Christmas catalog (right) by Delfonics. Notice the nib in the pattern of the paper bag. 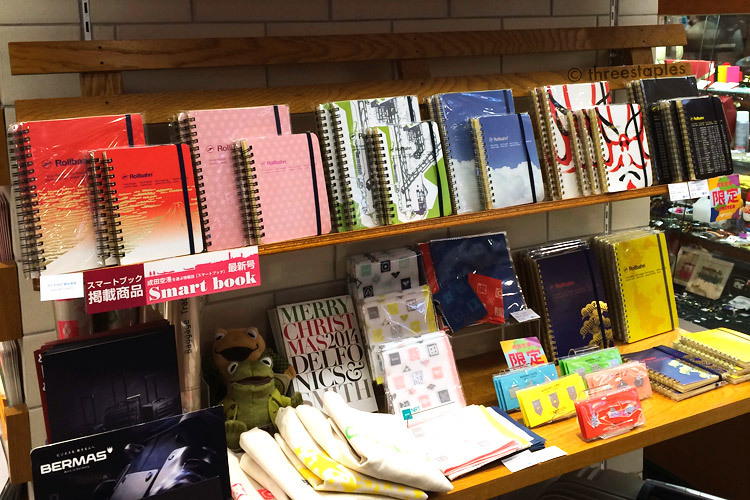 Rollbahn notebooks can be found at major stationery destinations in Tokyo, Itoya and Maruzen to name a few. I also mentioned in the beginning of this post that Delfonics have their own physical stores in Japan. They have two-types: Delfonics and Smith. You can find their locations here. If you’re in Tokyo or Osaka and love stationery, I highly recommend you visit Delfonics (and stock up! ), particularly the Shibuya Delfonics. Their stores are gorgeous spaces to browse, and you can find many well-known stationery brands like Lamy, rOtring, L!FE, in addition to their own line of products. If you are browsing department stores, you’re likely to run into Smith, which carries more casual stationery and other lifestyle goods. On my recent visit, it seemed every decent department store had at least one stationery shop, and it was often Smith. It was even at Narita Airport with NRT-exclusive editions of Rollbahn notebooks. Very cool, considering the travel-themed branding. Oh but you’re in Paris? You’re in luck; there’s Delfonics at Carrousel du Louvre. Look at all those Rollbahns at Itoya, Ginza. Dammit. Rollbahn corner at Smith, Narita Airport. Some of those covers were airport-exclusive designs.